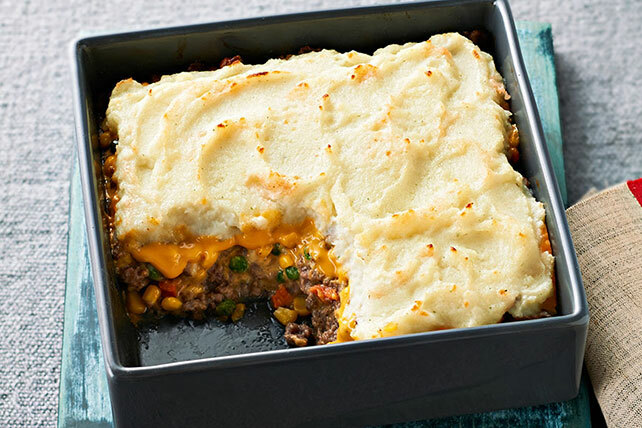 Buttery mashed potatoes, skillet-browned ground beef plus corn make this crowd-pleasing VELVEETA Shepherd's Pie Casserole your new in-house pub favorite. Brown meat in large skillet; drain. Return meat to skillet; stir in water. Add Vegetables and Seasoning Mix; stir. Bring to boil; cook 1 min. Reduce heat to medium-low; simmer 5 min., stirring frequently. Stir in corn. Spoon into 2-qt. casserole sprayed with cooking spray; cover with Cheese Sauce. Microwave Mashed Potatoes, milk and butter in microwaveable bowl on HIGH 3 min. ; stir. Spoon over cheese sauce. Bake 18 to 20 min. or until filling is heated through and topping is golden brown. Prepare using ground turkey breast, or 1 lb. boneless skinless chicken breasts, cut into 1-inch pieces.